A five-rib design creates a pattern of gripping edges for excellent traction. Lateral grooves and shoulder slots evacuate water from the contact area for effective wet weather driving control. 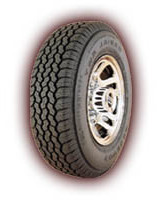 The arrangement of the tread elements also promotes even treadwear.